As any executive in a fast-growing company will tell you, vacation (at some point) is absolutely necessary. I am no different. A break from my PR business would offer me the time to recharge, gain perspective on things going on outside the walls of our business and help me lead our teams to do superior work on behalf of our clients. That's how I found myself soaked to the bone, after four days of not showering, and standing on a cliff 13,800 feet up, gazing down upon one of the most striking accomplishments of humankind, in one of the most beautiful places on earth. But, let me back up: Every year or two, I plan a vacation with four friends who date back to my childhood. These vacations usually lack any seriously lofty goals beyond scheduling in ample pool time, seeing the sights, eating good food and drinking a lot of good wine. But our June 2016 vacation needed a greater purpose: We were bent on accomplishing something to celebrate our 30th birthdays. So, after some deliberation, we decided to travel to Peru to complete the four-day Inca Trail trek to Machu Picchu. Machu Picchu is a 15th century archaeological site perched high in the Andes Mountains. Built during the Incan Empire, the site was abandoned, only to be "officially" rediscovered in 1911 by an American historian. UNESCO declared it a World Heritage Site in 1983. The Inca Trail is is said to have been trekked by Incan rulers and nobility journeying to Machu Picchu. During our own four-day sojourn, we travelled with two tour guides and a group of porters, who helped carry our equipment and set up camp every night. We hiked anywhere from six to 11 hours a day (with no telecommunications capabilities whatsoever) and set up camp each night in the Andes. Throughout the day, we had nothing more than what fit into our backpacks. In preparing for the trek, I had to make very conscious, well-thought-out decisions about what I would take with me and what would get left behind -- what I really needed. While this type of thought process is crucial to everyday business decisions, it wasn’t until I was made to think very hard about it (or risk sickness or physical repercussions) that I realized how important this thought process is. Limiting myself to essentials made me think to the future and all possible outcomes. It also forced me to work with others to divide and conquer: I’ll bring the sunblock; you bring the bug spray. The same can be said about business: Use your resources and allies to avoid overburdening yourself with unnecessary distractions that will weigh you down later on. At Konnect, we offer services in public relations, marketing, social media and content creation. While "marketing" could potentially offer an endless array of services, and though we get solicited daily for work outside our established categories, we stick firmly to working only in those agreed-upon spaces. We do this not because we are elitist or scared. We do this because we don't want to do just an "okay" job; we would rather be the best at what we do. Doing more might dilute our business and lower our quality of service. 2. Be prepared for the unexpected. As a type A control freak, I overthought everything. I prepared and over-prepared. I became anxious. In the end, none of that mattered, because once you are out there, trekking up to almost 14,000 feet through the elements, things are out of your control. So, prepare for whatever challenge confronts you, as much as you can, and do it wisely. But remember that the unknown is just that. After day one of our own trek, one of my good friends fell very ill due to elevation sickness. While we had expected to do the trek together, she was forced to turn back to go to town for medical attention. For the rest of us, the trek went on. For one friend in particular -- Shauna Martin, CEO of organic green juice company Daily Greens -- the "unexpected" had come four years before; it was Stage 3 breast cancer. Battling cancer led Shauna to seek a healthier lifestyle, and that in turn, ultimately led her to start her own business. Today, Shauna uses her experience to create healthy beverages for others to enjoy, while giving back to organizations that support young women battling breast cancer. Unexpected things will happen. Road bumps will arise. It is how you deal with the unexpected that can determine the rest of your trajectory. During the trek, the physical challenges were ample. Exhaustion loomed at every stage, and it was easy to become unmotivated. My back hurt, my feet hurt. I was too cold, too hot, too tired. Every time I felt those complaints overwhelm me, I took a break, and it was during those breaks that I was able to really take in and observe the amazing place I was in. 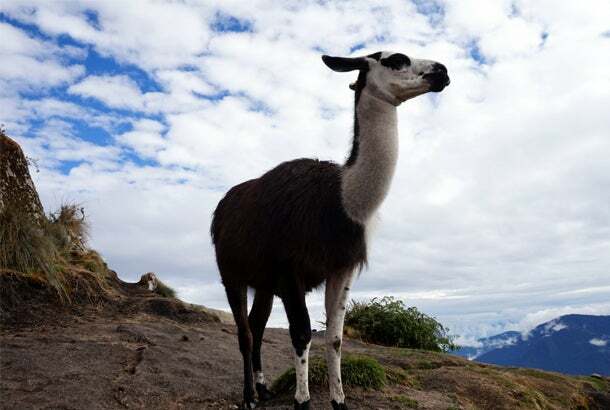 I, a tiny speck in the universe, was trekking through a majestic place where ancient rulers had walked before me and where the unexpected could suddenly happen -- like coming face to face with the llamas that roam free along those mountain paths, and come right up to you to say hello. Pretty insane. In one particularly stunning moment, I was lucky enough to take a break at the exact time that an endangered black spectacled bear appeared before us. I stood there for probably 15 minutes (time that could have been well spent getting ahead) to admire this beautiful creature as it ate berries, walked the mountainside and looked straight back at me. That was by far one of the most amazing moments I had during those four days and it would have never happened had I not stopped to actually appreciate it. The same is true for business: Cabeau CEO David Sternlight encourages his team to participate in a monthly charitable activity in which the entire company takes the day off to give back. In 2016 alone, Cabeau has given about 1,000 hours of volunteer time to organizations that serve children, the homeless and veterans, to name a few. While intuition may tell us to keep going and never stop, taking a moment to stop and smell the roses offers some of the most enjoyable moments as well as the clarity we all need to continue. 4. Be gracious and grateful to those who help you along your journey. Getting ahead is not a sole venture, either in business or on the arduous trek to Machu Picchu. In my business, I have a genius CEO and stellar team. During the trek, I had the amazing guides and porters of Alpaca Expeditions, who became my family as well as our on-site historians. Were it not for these people, I can honestly say I would not be where I am today. Also at work, we host a three-to-four-day holiday trip for staff every year to show our appreciation for a year’s worth of hard work and amazing results. Previous years’ trips include skiing in Lake Tahoe, wine-tasting along California’s Central Coast and a cruise to Mexico. We very much believe that our success is due to our work as a collective; and, as such, we show gratitude at every chance we get. So, all this is to say that what for me started as a quarter-"life crisis" trip to prove to myself that I was still young, ended up being a lesson in life, business and perspective. When you love what you do, business lessons reveal themselves everywhere you go.